This weekend sees the Perth Convention and Exhibition Centre turn it out with Western Australia’s only Kustom Kulture event. West Coast Lowdown 2017, carefully curated across two days of rad, runs Saturday, October 14 to Sunday October 15. This is not your old man’s auto show. It’s a promising line-up of lowriders, skating, hot rods and bikes, punk rock, lowbrow art, tattooing and a bunch of beautiful dames in an old school mash up of a pin-up pageant. What’s not to love? Kustom Kulture is all about finding your own way. It’s part rockabilly, part nonconformist, part creative expression. Kustom Kulture focuses heavily on traditional styled hot rods and kustoms, with a heavy focus on scene involvement, music, tattooing, skate and bikes. 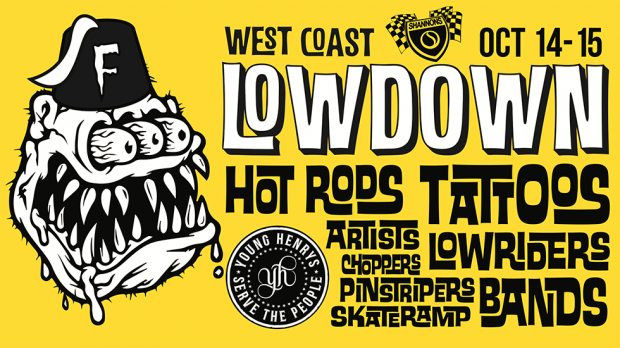 West Coast Lowdown 2017 is the third year of the event running in WA. This year has expanded its attractions in the new space provided by PCEC to allow for some killer attractions and demonstrations across two massive days. The Lowrider Hop King Showcase promises to deliver the goods, with some pure California car culture on show in a WA first. The boxing ring of the lowrider world, each car will battle it out in a dedicated arena, reaching promised heights of over six feet. That’s almost vertical, and worth the price of admission. The Kustom Kavalcade promises to deliver too. Never before attempted at an indoor show in WA, each Featured Builder vehicle will be driven into the pavilion and parked, live in front of a grandstand audience, with an MC introduction for each vehicle. Another fresh attraction to this year is the Bike Build Off. Most of the state’s top custom bike builders are set to compete under strict conditions to become the top Bike Builder for Lowdown 2017. Building to a strict budget of just $10,000 the challenge is designed to show off what can be built by the average builder with limited funds. Add to this the addition of Tattoo Alley, with some of WA’s top tattoo artists, the Miss West Coast Lowdown Parade, the Pinstriper’s Jam, and Lowdown After Dark commencing from 7pm with bands and boozing. West Coast Lowdown 2017 hits the Perth Convention and Exhibition Centre this Saturday, October 14 to Sunday October 15.